Clockwise from top: This site, north of Port McMurray, is part of what’s being called the Quarry of the Ancestors; archeologists at work north of Fort McMurray, Alta. ; three spear points found in Alberta’s oilsands. Heading up Highway 63 out of Fort McMurray, Alta., you are a witness to the frenzied action that is all about the oilsands. Semis, flatbeds, buses, pickup trucks and vans everywhere and gargantuan 400-tonne Caterpillar dump trucks moving with purpose over the horizon, all in aid of squeezing a precious resource out of the hinterland of northeastern Alberta. To many, the human action here is a relatively new phenomenon. But thanks to provincially required heritage impact assessments for the mammoth oilsands projects, archeologists are discovering the area has been abuzz for millennia.Proof of ancient human activity is being found at hundreds of archeological sites in the Athabasca lowlands, a region that was almost a complete void in the archeological record just a few decades ago. Like all provinces, Alberta has a government-regulated system for ensuring the protection of historical resources such as archeological sites. Under the Alberta Historical Resources Act, when any project risks damaging a historic resource, known or unknown, the person or company undertaking the activity is required to conduct a Heritage Resource Impact Assessment (HRIA) at their own expense. Regulated by Alberta Community Development, these are normally subcontracted by developers to qualified consulting archeologists. A system of permits ensures projects will not get approved without an HRIA. According to Statistics Canada, in 2004 Alberta’s oilsands accounted for 38 per cent of Canada’s crude oil production. Recent rises in world prices and tight supplies, coupled with declining conventional production, have spurred almost $40 billion in proposed oilsands investment which is projected to increase the oilsands share to 67 per cent by 2010. The resulting level of HRIAs has boomed along with it. Prior to recent oilsands activity, little funding went into exploring this boreal forest for artifacts because you got such little data for your investment. Boreal forests are tough environments where evidence is hard to come by. Acidic soils eat up bones, leather, wood and other telltale organic residues, offering little to reconstruct ancient ways of life and almost no opportunities for radiocarbon dating. Stone tools, their manufacturing waste and fire-broken rock from campfires are mostly all that remain, and they are hard to find. Moreover, unlike the prairies with their buffalo jumps and communal hunting, boreal forest hunters generally chased solitary animals in dispersed locations. For archeologists, this has made finding spear, dart and arrow heads or points a hit or miss affair. Adding to these woes is the sheer difficulty of locating the sites amid dense forest, muskeg and mosquitoes. The Athabasca lowlands were not always like this. Ten thousand years ago the climate was warmer and drier. Humans may have been living here as long ago as 10,500 years but recent geological studies by University of Calgary geographer Derald Smith have shown they would not have stayed long. Smith and his team have found evidence that 9,900 years ago a massive flash flood of glacial melt water, called the Agassiz Flood, scoured its way through northeastern Alberta. The study showed that as the flood waters retreated over the next 400 years, a complex of ridges, knolls, benches, escarpments, bars, beaches, spits, peninsulas and islands emerged. These features were all part of a redefined system of lakes and a very wide Athabasca River with extensive bays where the oilsands leases rest today. The very shapes of these ancient landscapes and shorelines defined human use. Archeologist Brian Reeves and his team discovered complexes of ancient campsites and stone tool workshops while under contract to undertake an HRIA for the Aurora North Mine Project. One highly significant site was on an old shoreline of a past lake named Nezu. Projectile points found at Nezu date to around 9,000 years ago. Reeves theorizes they were left behind by hunting groups who migrated from the northern plains, attracted by the thousands of animals grazing on the shrubby grasslands made possible by the warm, dry conditions. Knives, scrapers and other stone tools point to a variety of activities as they camped all along the old lakeshore. Analysis of blood residues on the tools has provided clues as to what animals were being exploited: bison, caribou, moose, beaver and bear. These archeological sites are of no small consequence. Reeves and his co-researcher, archeologist Nancy Saxberg, feel Nezu and the sites discovered along the old shorelines are of national significance. He says such a discoverable record exists in very few locales in North America. “The Lower Athabasca record has outstanding potential to contribute fundamental knowledge to the nature of the early northern landscapes and their reoccupation by early native peoples, the nature of these people’s cultures, their responses to the landscape and the following initial occupation of the Western Barren Lands,” he says. Supporting his theories are more than 100 archeological sites found in the Aurora Project area alone. The earliest oilsands HRIAs happened in the early 1970s. One of the first sites was dubbed the Beaver River Quarry. It yielded one of the earliest pieces of evidence in the area: a spear point of a type that occurred on the northwestern plains as early as 10,500 years ago. Another matched a southern plains type from between 10,000 and 9,500 years ago. That Shell Canada HRIA yielded 49 new sites on the east side of the Athabasca River. Eight of these occurred in a picturesque and peaceful crescent-shaped ridge overlooking a small backwater lake beside the Athabasca called Creeburn Lake. When archeologists discovered thousands of stone tool flakes and broken tools there, in such a pleasant spot where ancient toolmakers and their families could gather in very large groups and watch for game, they immediately understood their significance. The eight, along with others since discovered on the ridge, were later consolidated into one called the Creeburn Lake Site, which has been designated a Provincial Historical Resource by the Alberta government. Local aboriginals such as the Fort McKay First Nation still consider it a special place and they hunt and gather traditional plants around the site area. So Shell Canada didn’t mind at all giving up part of their oilsands lease to accommodate Creeburn’s special status. “When we first started we were struck by the significance of the site,” says Jeff Gabert, Shell’s public affairs representative for oilsands. “We are close partners with the aboriginal community and wanted them to be involved with the project from the start, so it just made sense.” Shell had a booklet commissioned about the site that is used in local schools and libraries. And when it comes to resources, Ives says it’s unfortunate that the acidic soils dissolve evidence of important subsistence sources like fishing, so we can’t get the whole picture. “Early studies in the oilsands series were estimating that two and a half to three million whitefish would have been running in the Athabasca River in the fall,” he says. Ives’s vision of harvesting this resource has been enshrined in a Syncrude Gallery diorama at the Provincial Museum in Edmonton. Smaller projectile points with notches in their bases appeared at Creeburn Lake starting around 7,750 years ago, heralding the arrival in the area of a new weapon. The atlatl was a throwing stick or board with a notch at one end used to propel a dart, much like a lacrosse stick does for a ball. It was well adapted to the open grasslands of the time. And points dating from 4,500 to 3,500 years ago were also recovered from Creeburn Lake, showing the area was still popular after the encroachment of today’s forest and muskeg, which was complete about 5,000 years ago. As interest in developing northeastern Alberta oilsands accelerated into the late 1970s, archeological explorations kept pace. But the roll was soon to come to an end. New oilsands activity ground to a virtual halt in the early 1980s as policies instituted by the Trudeau government and a collapse in crude prices essentially killed interest in oilsands development. Except for a few surveys that weren’t funded by the energy industry, the flow of new data stopped. There was a bit of a silver lining to that cloud. Ives recalls jumping at an unexpected opportunity. “Back about 1980, the Alsands project had cleared a massive area,” he says. “We walked around this and soon realized the immense density of sites in the region. What was really surprising was that almost every little bump on the terrain had some kind of site on it. Some of them had three or four.” It was before Smith’s analysis of the Agassiz Flood and Ronaghan’s landform simulation program so Ives at the time had spotted the pattern of sites occurring on what later turned out to be ancient islands and shorelines. Around the time Ives was checking out the old Alsands lease, Ronaghan made a momentous discovery there, too. It was something archeologists had never seen this far southeast: microblades, tiny scalpel-sized stone blades that anthropologist Sheila Greaves has called “highly expedient and portable tool kits.” Christened the Bezya Site, Ives and the Archeological Survey of Alberta then put together an extensive investigation of it and concluded it was the extreme southeastward expansion of what is known as the Northwest Microblade Tradition from around 4,000 years ago. The whole microblade manufacturing sequence was represented here in immaculate detail–pieces were found that fit together as neatly as a jigsaw puzzle. Soon industry-funded HRIAs returned. The late 1980s brought a resurgence of oilsands interest as the Mulroney government dismantled the National Energy Program. Archeologists interested in the Athabasca lowlands could look forward to new studies as the oil companies’ old plans were dusted off and revitalized. It proved a new boon, bringing about the unprecedented finds on the Aurora North Lease. 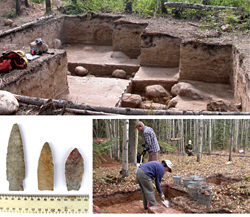 As well, fresh excavations undertaken at the Creeburn Lake site turned up what are called Taltheilei points, the first concrete evidence of the arrival of the Taltheilei culture. Ancestral to the Dene, these forest-adapted people migrated from their homelands in the Yukon and Mackenzie River drainage and brought their new hunting tactics, using their smaller points on the bow and arrow. In one of the rare radiocarbon dates from the site, the date of the point was fixed at 1,240 years ago. Thanks to oilsands development, for the first time archeologists are able to piece together aspects of prehistoric life for almost the entire 10 millennia humans have lived in the Athabasca lowlands, positive proof that the area was abuzz with activity long before the quest for oil. Archeologists and oilsands developers welcome these findings and seem to agree that the process is working. oilsands development is good for the province’s future, and–through HRIAs–it has become an integral part of preserving the past.